A relatively simple concept, antenna gain has proven to be problematic in certain circles of the radio world with a few distinct groups: antenna professionals, antenna aficionados and most everyone else. Everyone understands the general idea, but when decibels enter the picture we have trouble. The problem centers around the notion of what reference to use so that everyone is on the same channel. Fortunately the established antenna community has things well in hand. Let’s step our way though the topic and see what we can learn from the pros. There is a difference between Directivity and Gain, but for the remainder of this article I will assume antenna efficiency is perfect and assume they are the same. A key feature of the professional antenna community is the reliance on the isotropic radiator, itself based on the very definition of directivity , as the rock solid reference from which we measure all antennas. Looking at figure 1a above we see radiation of power equally in all directions. This is impossible to achieve with any practical antenna, but because it is based on a solid definition, it is unwavering as a reference. Figure 1b shows a Diamond CP22E antenna revealing how the power intensity is taken from some directions and added towards the waistline. …or about twice the power radiated towards the horizon. The bel is rather large in scope prompting the popularity of adding an SI prefix to create a smaller, more pragmatic unit. SI fractional prefixes include deci, centi, milli, micro, etc. making decibel, centibel, millibel, microbel, etc. all valid forms. One tenth was deemed a handy value in the 1930s so decibel has been the go to unit for logarithmic voltage and power gain representation since. The “d” is always lowercase. The “B” is always upper case. The nature of the decibel is such that instead of multiplying linear values of gain you can, instead, add logarithmic values of gain. Let’s redo the above example. Linear and log – six one way, half-dozen the other. …where dBd is another well known shorthand notation for gain with respect to a dipole. Note the reference dipole is always about 2.14 dB higher (or exactly 2.15 dB higher if you are the FCC ) than isotropic so the two are merely a constant value from each other… always. In the antenna community, dBi and dBd mean nothing else! Gain pain – alternative expressions for dBd?!?!?! Chillingly many folks (hams mostly) believe dBd has alternative definitions where, for example, an antenna is above ground. Nothing in professional antenna engineering circles suggest that. While it is true comparing and contrasting antenna gains over ground makes some sense, this doesn’t give anyone carte blanche to rewrite the dictionary. Changing terminology due to misunderstanding is careless at best and possibly fraudulent at worst. M2 never redefines the isotropic meaning of dBi or its derivative dBd as the poster suggests. M2 has carefully prepared their data to be non-ambiguous so it can pass the smell test of the antenna engineering world. What’s missing, of course, are the characteristics of the ground. To be above board that really should be part of this data, but hey… an A for effort. So… M2 verifies for us they see dBi and dBd as both referencing isotropic circumstances, as used by those in the professional antenna community. They make crystal clear where they deviate from these measurement constants. If they did not, they would eventually be flagged for erroneous specifications by purchasing agents in the know. This could become a serious embarrassment especially if they sell to government and corporate customers… which seems likely given their stature in the antenna biz. M2 correctly avoids using erroneous sammy the hammy antenna jargon – they know better. I suspect other major players in the antenna biz do so as well. My antenna has x dB gain – oh no! Copper SlimJim antenna with ‘Gain: 6 dbi’ – They try to pass the idea a 2-3 dBi antenna has twice the gain than is possible. False advertising? Perhaps they don’t quite understand how SlimJims work? You be the judge. 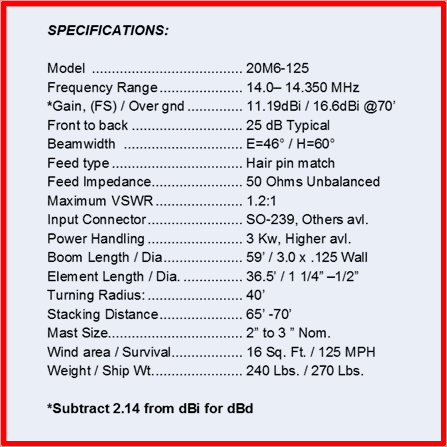 Low Power FM (LPFM) Broadcast Antenna – with a gain claim of “3 dbi (2.5 dbd)” – You do the math and evaluate the antenna knowledge of the author. The lowercase b in db says something about the authors as well. Wow 6.5 dB gain over a dipole… something not even possible with four collinear elements let alone the two in this design. 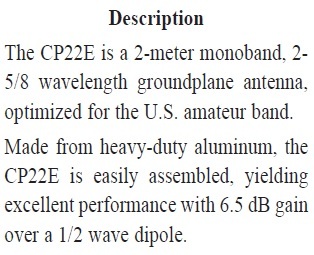 In reality the CP22E achieves about 2.85 dB over a dipole or about 5 dBi gain. This antenna is a very capable performer, approaches the theoretical two-collinear-element 3 dB improvement over a dipole and does so at a very good price. However, those who generate the documentation at Diamond Antenna have totally jumped the shark in the sad attempt at gainflation. 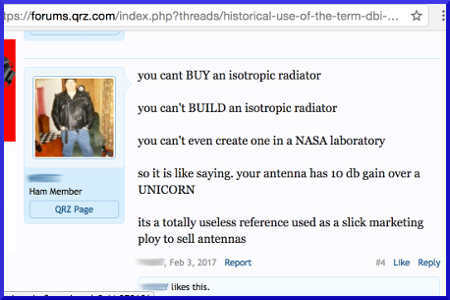 Yes I admit to being an antenna jargon purist, but am making it clear the above issues reveal some serious lack of knowledge of folks claiming to be in the antenna manufacturing business. They need to step up their game before someone, perhaps from the FTC, calls their hand. Half-baked understanding of any discipline is not a sin. We all were beginners once and had to learn. The learning never really ends, but some appear to reach a point of understanding and then the locomotive of their education train stops with a loud bang. Thereafter they base life’s decisions on truncated knowledge. The defending of dBd as non-isotropic using backfiring evidence from M2 was humorous. Hammy antenna manufacturers too often blow smoke you know where in some of their product specifications. When hams or any antenna makers contradict the first 30-50 pages of ANY college level antenna book, be very afraid. Is it any wonder I often enter ‘QRM.com’ by mistake. Cheng, David K. (1983). Field and Wave Electromagnetics. Addison-Wesley Publishing Company. Ralph W Campbell. Patent US3491361A. 412172 Determining ERP and ERIP, FCC. William H. Harrison (1931). “Standards for Transmission of Speech”. Standards Yearbook. National Bureau of Standards, U. S. Govt. Printing Office.